50 years ago Lord’s Day October 23rd. Lord’s Day 23rd October 1966 a ‘Welcome Home’ rally was attended by some 12,000 people to mark the release from the Crumlin Road prison of Rev Ian Paisley, Rev John Wylie and Rev Ivan Foster. Those truly were the beginning of revival days. Please read the article “A time to be remembered” located below and see something of God’s mercy and blessing upon a reproached people 50 years ago. “To the only wise God our Saviour, be glory and majesty, dominion and power, both now and ever. Amen,” Jude 1:25. 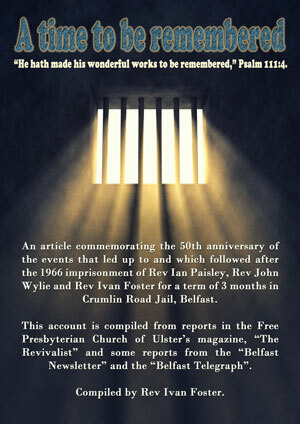 A feature article commemorating the 50th anniversary of the events that led up to and which followed after the 1966 imprisonment of Rev Ian Paisley, Rev John Wylie and Rev Ivan Foster for a term of 3 months in Crumlin Road Jail, Belfast.This account is compiled from reports in the Free Presbyterian Church of Ulster’s magazine, “The Revivalist” and some reports from the “Belfast Newsletter” and the “Belfast Telegraph”. I have put together this collection of articles which appeared in the Revivalist in 1966 and 1967, and one from 1968, as well as some newspaper accounts of the June 6th protest, led by the late Dr. Paisley. The parade consisted of some 200 Free Presbyterian men, woman and children. It processed from Ravenhill Church to the building where the annual General Assembly of the Presbyterian Church was taking place. The aim of the event was to honour God, contend for the faith and highlight the ecumenical apostasy of that denomination. Such were the consequences of that night’s protest that the small Free Presbyterian church, hardly known outside of the six counties of Northern Ireland, became the subject of discussion, mostly derogatory, throughout Christendom! But much more important was the moving of the Spirit of God that became evident within the ranks of the Free Presbyterian church from that time. God was pleased to work mightily amongst us, adding to our numbers many new congregations and hundreds of new converts. Printed copies of this article are available – £5 + PP. *The words ‘desolation without an inhabitant’ clearly indicate that this prophesy has not yet been fulfilled but its fulfilment lies in the future. CD recordings of these messages are available free of charge. Contact Kilskeery@independentchristianschool.org with your name and street address. A donation for postage would be appreciated. A message preached by Dr. John Douglas, in which he expounds the Bible’s teaching on the development of the kingdom of the Antichrist and the role that the European Union will play in that development. We would ask our friends who do not share in our view of prophecy – premillennialism – to give serious consideration to this message. When it comes to the study of prophecy, this subject is a very elementary one, yet it is a subject to which many give little thought. 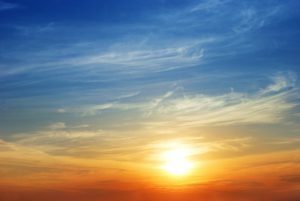 Many Christians have a general view of the return of Christ, that it is going to happen, but they are not well versed on what the Bible has to say about that glorious event. That ought not to be. It is a subject with which God’s people should be well acquainted. It is clear from the Word of God that the Christians in the days of the apostles were very well taught about the return of Christ. Indeed, when Paul wrote to the Thessalonians, he said he needed hardly to write on this subject as they knew about it perfectly (1 Thessalonians 5:2). It could be thought that those early believers would have had to learn so many subjects; that they were to be taught in doctrine of which they never had the slightest knowledge before the gospel came to them. Paul would have had to deal with the doctrine of God, His Person, His power, the mystery of the Trinity, and the inspiration of God’s Word. Although there was so much to teach, the apostle found time to tell those early believers about the second coming of the Lord and of the end times. Many ministers today would speak as if Paul had so much else to proclaim, that teaching about the return of Christ and the doctrine of eschatology could be left to a later generation. Read more or listen using this link or the player below. 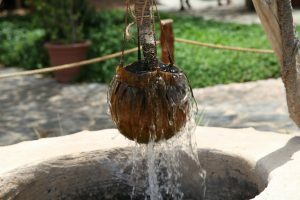 Digging wells for our children to drink from. This portion of God’s Word is illustrative of the ongoing struggle that each succeeding generation of believers must engage, in if they are to enjoy the benefits of the covenant of grace. That which ensures that there is an ongoing struggle is the unchanging enmity of the enemies of God’s people. Conquered by one generation of believers, they will rise up to challenge the next. Isaac found this to be so. “The Philistines had stopped them after the death of Abraham”. 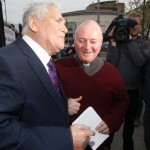 Here in Ulster, the establishing and successfully running of independent Christian schools is central to that ongoing struggle. Listen to the message using the player below or use this link. As a church we revere the Bible. It is given a prominent place in our services and in our lives. We preach its doctrines and contend for its truths. To mark the fortieth year of our church we can think of no better memento to give to our children than a copy of the Bible. 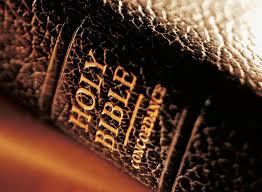 The word BIBLE comes from a Greek word BIBLOS = The BOOK. This is the BOOK for us in Kilskeery. We hope it will become the BOOK of all the children and young people here tonight. Read more…or listen using the player below. If you cannot use this player click here. 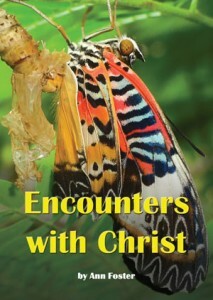 “Encounters with Christ”, by Ann Foster, is a Bible-based record of some notable miracles of healing wrought by the Saviour during His earthly ministry. He healed multitudes, giving sight to the blind, casting out devils, cleansing the lepers, causing the lame to walk, the deaf to hear, the maimed to be whole, the palsied to recover and imparting life to the dead. These miracles were always accompanied by earnest prayer, a consciousness of need and faith on the part of the one who sought healing. 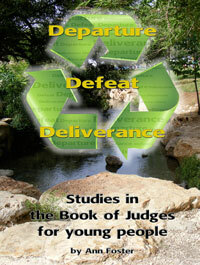 They also illustrate vital gospel truth. Sinners are spiritually blind, controlled by Satan, unclean, lame, maimed, paralysed and dead as a result of sin and they desperately need the spiritual healing and deliverance which Christ alone can give. They too must come with a deep consciousness of their sin, earnestly seeking salvation and believing that Christ alone can save. The book also details some notable conversations with individuals. Again gospel truth is illustrated. In the Lord’s conversation with the woman of Samaria, He revealed to her the depth of her iniquity and His identity as the Messiah. The sinner must realise and acknowledge his sin in the eyes of a holy God and recognise Christ as God’s only anointed Saviour. In His conversation with Nicodemus, He stressed the necessity of the new birth even for a self- righteous sinner, spoke of His death on the cross, using the symbol of the uplifted serpent in the wilderness, to secure eternal life for His people. However, not all who were healed were saved. Some, like Malchus, accepted healing for his severed ear, but rejected Christ’s message. Not all who talked with Christ, like the rich, young ruler, heeded His instruction to leave all and follow Him if he wished to obtain eternal life. Mercifully, Nicodemus was born again, despite all appearances to the contrary, for we find him at the cross with Joseph of Arimathea, carefully removing Christ’s body, wrapping it in spices and fine linen, laying it in the tomb and rolling the stone to the door. 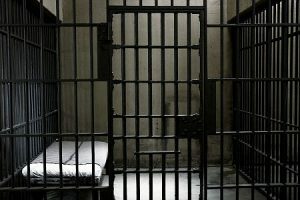 Read Part 5 of the exchange here. Rev. Foster is engaged in an ongoing series of studies in Kilskeery Independent Christian School morning assemblies in which he deals with the theme, “Pictures of Christ in the Bible”, i.e. the descriptions and types of Christ given in the Scriptures. Each new study will be added as it becomes available and you can listen to new studies using the player below. 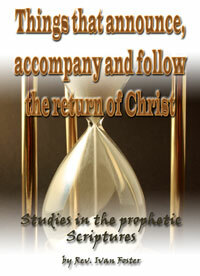 Previously published studies in this series can be heard here. Can anybody truthfully say that Irish is a necessary language? Executive rids itself of old guard but are they up to the job? Inappropriate, ludicrous and no real apology – is there no limit to the propagandist nonsense from Gerry Adams? These parades by people in masks break the law… so what are the police going to do about them? Vote for us to Keep SF Out Claim Some – But Will they Give SF Speaker’s Chair in First Act? I believe with all my heart that there is a need for the people of God to return to that spiritual state in which the early church was – a waiting expectantly for the return of Christ. So it was in Thessalonica. “For they themselves shew of us what manner of entering in we had unto you, and how ye turned to God from idols to serve the living and true God; and to wait for his Son from heaven, whom he raised from the dead, even Jesus, which delivered us from the wrath to come,” 1 Thessalonians 1:9-10.